Listening to music inspired by visual art, The Art of Noise exhibition invites visitors to explore how music alters the way they look at art and gives them the opportunity to enjoy a multi-sensory experience in the gallery. Mother and Child by renowned Liverpool sculptor and artist Arthur Dooley (1929-1994) has been specially chosen by The Atkinson Development Trust to be a part of The Art of Noiseexhibition and is pictured with Ray Highton and Jo Chamberlain from The Atkinson as they prepare for the exhibition. 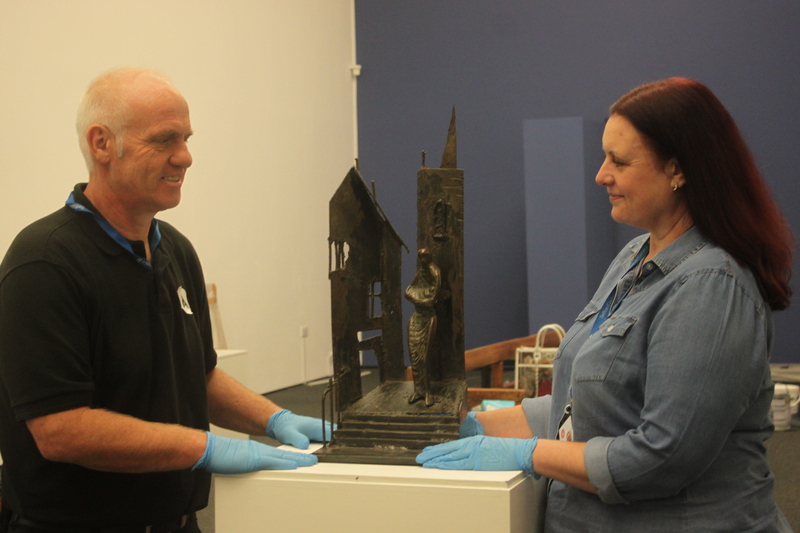 This piece has not been on public display for over ten years and the Trust are delighted to give people the opportunity to see it. Arthur Dooley was a member of the Merseyside Worker Artists Association and helped establish the Liverpool Academy of Arts. He was highly esteemed during his lifetime for his unique style and left an undoubted mark on the world of art and the social history of Liverpool. The Trust have chosen The Beatles’ track Lady Madonna to accompany the sculpture. Released as a single in March 1968, the song’s main writer, Paul McCartney explained: “Lady Madonna started off as the Virgin Mary, then it was a working-class woman.” The song suggests there are different ways of interpreting the piece, from the classic religious ideal of the Madonna, to the reality of hard-working motherhood in the present day. Arthur Dooley was a contemporary of the band, and Mother and Child was made just two years before Lady Madonna was released. Whilst his work was often religious in theme, and can be seen in churches and cathedrals across Merseyside, in 1974 he produced the first statue to commemorate The Beatles. The Four Lads who Shook the World, on Mathew Street, depicts Liverpool as Mother Mary, cradling her babies, The Beatles.